Eurocom Corporation (www.eurocom.com), a developer of long lifespan, fully upgradable notebooks is adding the newest AMD Radeon HD 7970M GPU to their extensive options list of Ivy Bridge powered, high performance notebooks. The addition of the AMD Radeon HD 7970M offers users a new level of high performance GPU computing. Eurocom will also offer the AMD Radeon HD 7970M GPUs separately to existing customers as an upgrade option. The addition of the AMD Radeon HD 7970M, the highest performing mobile solution from AMD, gives Eurocom customers a superior choice of video processor options to configure into their new Eurocom system or upgrade into their existing system. The addition of the AMD Radeon 7970M GPUs in single and CrossFireX offers customers a greater selection of video processor options to fit any preference or performance level. “The AMD Radeon HD 7970M is going to elevate GPU performance to new heights by providing superior performance combined with high reliability and extremely high price/performance ratio. We are looking forward to further improving performance in Intel Chief River and Ivy Bridge platforms. AMD 7970M offers extensive driver support for Windows 7, Linux as well as Windows 8,” states Eurocom president Mark Bialic. AMD Radeon™ HD 7900M Series graphics processors are the most technologically advanced and feature-rich mobile GPUs AMD has ever created, enabling unsurpassed HD gaming and stereoscopic 3D entertainment. Eurocom has combined AMD technology in their mobile systems to offer a stellar entertainment powerhouse with massive computing power delivering desktop graphics power to mobile gamers for the ultimate performance at home or on-the-go. “Eurocom has been working together with the AMD team for many years. 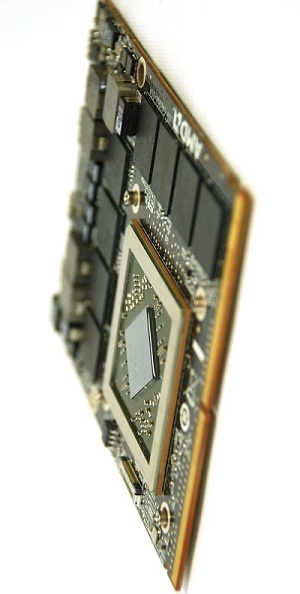 In the past we have integrated AMD processors and ATi graphics solutions into a number of our systems. The AMD Radeon HD 7970M will enhance the capability of our products and offer customers a wider selection of high performance GPU solutions” said Mark Bialic, President of Eurocom. Eurocom will be supporting AMD Radeon HD 7970M graphics processors in its entire line up of discrete graphics notebooks in single and CrossFireX configuration in select systems. The EUROCOM Neptune 2.0 is a 17.3” Mobile Workstation that utilizes the Intel Mobile HM 77 Express Chipset with support for the full line of 22nm Ivy Bridge Processors. Graphics support comes from new AMD Radeon HD 7970M with support for up to four storage drives; two drives support SATA 3 technology, another is a high performance mSATA drive, the fourth takes the place of the optical drive. The Neptune 2.0 supports 32 GB of DDR3-1600 memory for unforeseen multitasking ability and performance. The EUROCOM Racer 2.0 is a 15.6” small form factor Mobile Workstation utilizing the Intel Mobile HM 77 Express Chipset with support for the full line of 22nm Ivy Bridge Processors. Graphics support comes from AMD Radeon HD 7970M with support for up to three storage drives. Two of these drives support SATA 3 technology, one is a high performance mSATA drive, and the other takes the place of the optical drive. The Racer 2.0 supports 32 GB of DDR3-1600 memory for unforeseen multitasking ability and performance in a 15.6” system.